On a trail walk I came upon a landscape plant that was purposefully planted in the forest. Who planted this Korean Dogwood, Cornus kousa, in our nearby State Park? What were they thinking?! Obviously, no one was thinking about the appropriateness of planting an exotic tree on a nature trail here in south-central Pennsylvania. We’re supposed to be protecting our natural heritage in places like State Parks, aren’t we? Why not show off our native plants instead of a foreign one? Walking the Mill Race Trail at Little Buffalo State Park yesterday we were a week or so early for seeing the woodland spring flowers that come up in abundance there. Every year around this time we like to go for woods walks looking for the earliest Spring flowers. 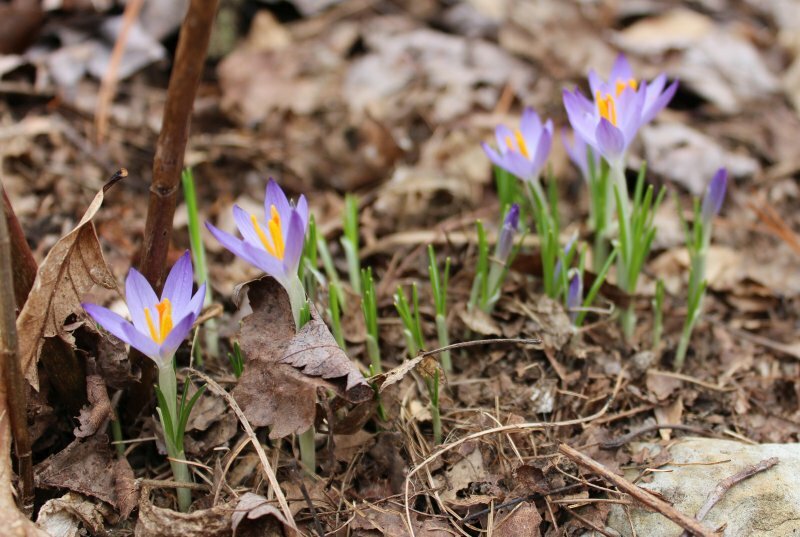 The Spring Ephemeral flowers are a bunch of beautiful early Spring flowers that one can see in the Eastern forests of the United States. Early in the Spring season means before the trees leaf out and not on a certain calendar date. 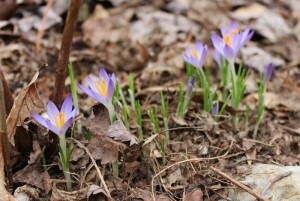 This year seems behind last year by about a week judging by a set of early crocuses that were planted a few years ago. In 2013 they were in full bloom on 27 March and in 2014 the first individuals of the set were blooming yesterday. Here in South-Central Pennsylvania the Mill Race Trail at Little Buffalo State Park is a convenient place to find early spring wild flowers. It’s practically adjacent to the parking lot and a short 1/2 mile trail.